My first encounter with quinoa was all positive: my daughter-in-law Julie took me to an adorable coffee shop called The Red Cup in Mukilteo, Washington, overlooking the water. The kind of cafe with bright funky colors alongside soothing bohemian baristas in Birkenstocks and granny skirts. So today I faced down my fears. I marched to my rice maker, poured a cup of quinoa and 1 ¼ cups of water into the bowl, turned it on, then walked away slowly. When I returned, hesitantly, 15 minutes later… a miracle had occurred. The tiny little beads had burst and turned nutty and fluffy and … awesome. 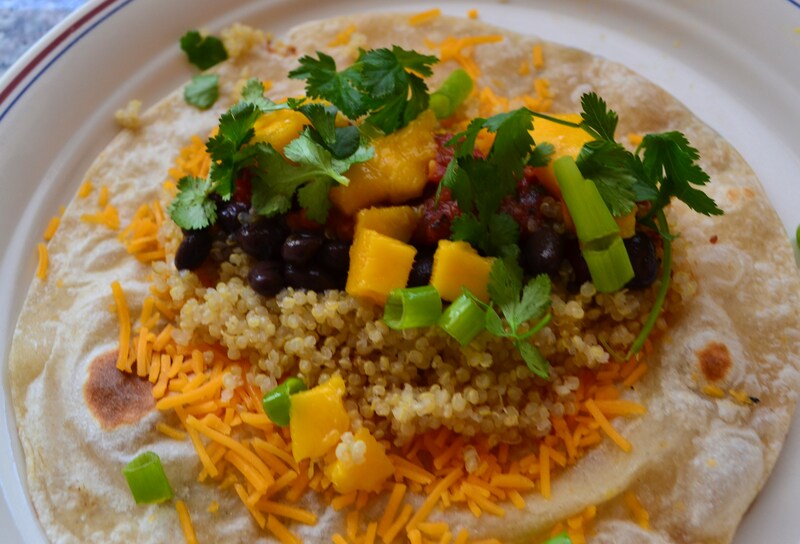 The rest was easy and familiar: I grilled a tortilla, sprinkled a little cheese around, then layered quinoa, black beans, salsa, mango,cilantro and chopped green onions. Rolled that baby up, cut it in half at a diagonal. 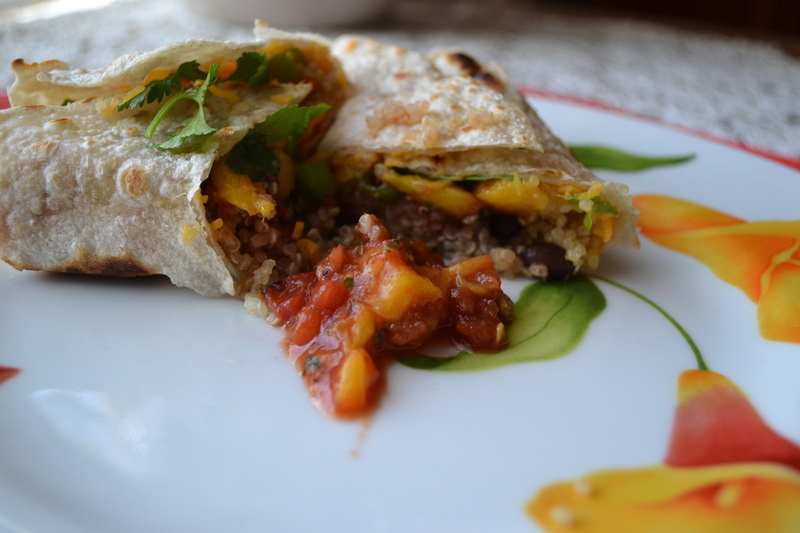 and dipped it in a bit more salsa mixed with diced mango. I was immediately transported to that café in Seattle. 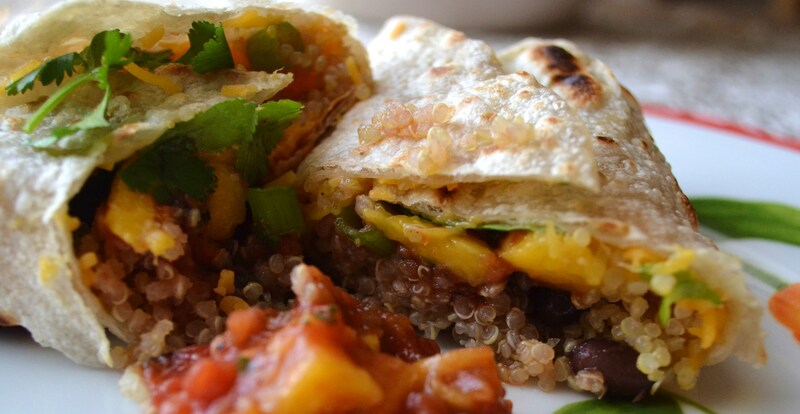 Layer cheese, quinoa, black beans, 2 T. magno, cilantro and onion. Tuck in two sides and then roll up into a burrito. Cut on the diagonal, in half. 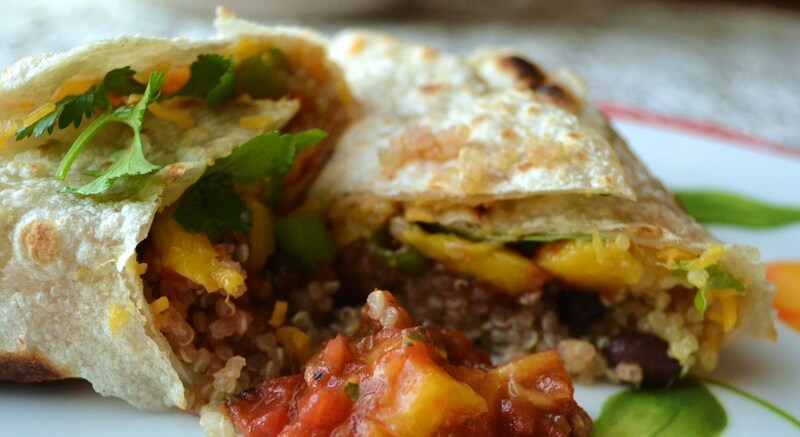 Mix salsa with remaining mango and serve alongside the burrito. I really did mean to scoot down and cradle his head in my lap. I really did not mean to kick him hard in the temple with my knee in the process. Thankfully, Greg wasn’t so wounded that he lost his sense of humor: he pretended I knocked him unconscious. He was able to walk on the ankle in just a few minutes, but I still wonder if it was just a heroic attempt to save himself from my further attempts to help him. On the other hand, I once expertly performed the Heimlich maneuver on a woman who was choking in the women’s restroom. Just as calm as you please, I walked into her stall where she had been coughing and banging on the door, and was now turning blue.I told her not to worry, that I was going to do the Heimlich (that I’d heretofore only seen done on TV). Somehow I did, and out popped a piece of pineapple from her mouth. As soon as she could breathe normally again,she announced to everyone around that I had saved her life. Maybe I’m better in life-threatening situations than I am in more minor emergencies. A nurturing person at heart, I wonder sometimes if I could have made a good nurse. My husband says, “You would have been a wonderful nurse, Becky. Your patients would have loved you and you would have kept them laughing and smiling…. right before you accidentally killed them.” It is true. I can’t keep up with my own cell phone or purse on a daily basis, so keeping track of med dosing schedules for patients would have certainly been a crap shoot. I’ve probably made better and safer use of my nurturing nature by caring for ailing folks through gifts of home cooking. I woke up from a nap the other day with the idea for this dish dancing in my head. It was even better than I imagined it would be. 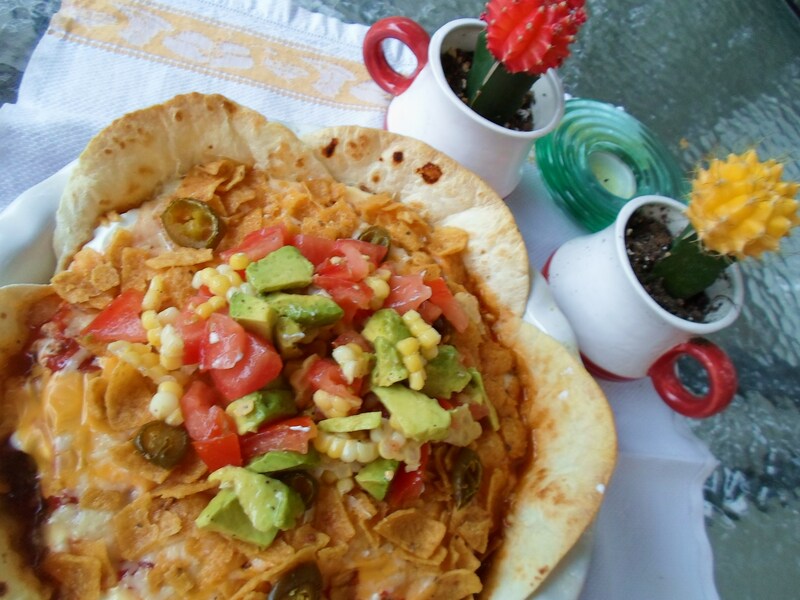 It uses simple ingredients that most of us have on hand, but arranges them in a way that looks like big, colorful Mexican flower in a pie pan. It would be a wonderful dish to take to a friend who has twisted their ankle, cut their leg or been kneed in the head by a clumsy do-gooder. 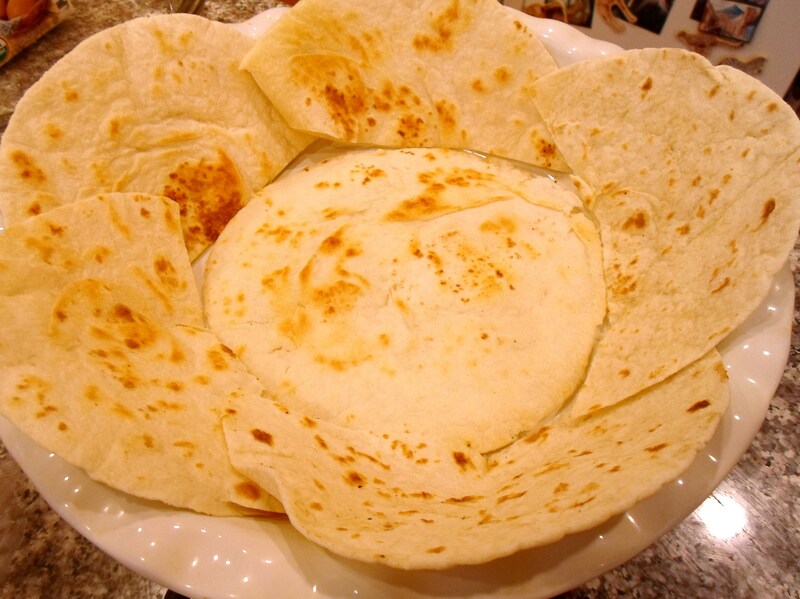 Lightly oil a skillet or griddle and brown a whole one round tortilla and five halved tortillas in batches, until they are light golden brown in spots on both sides. 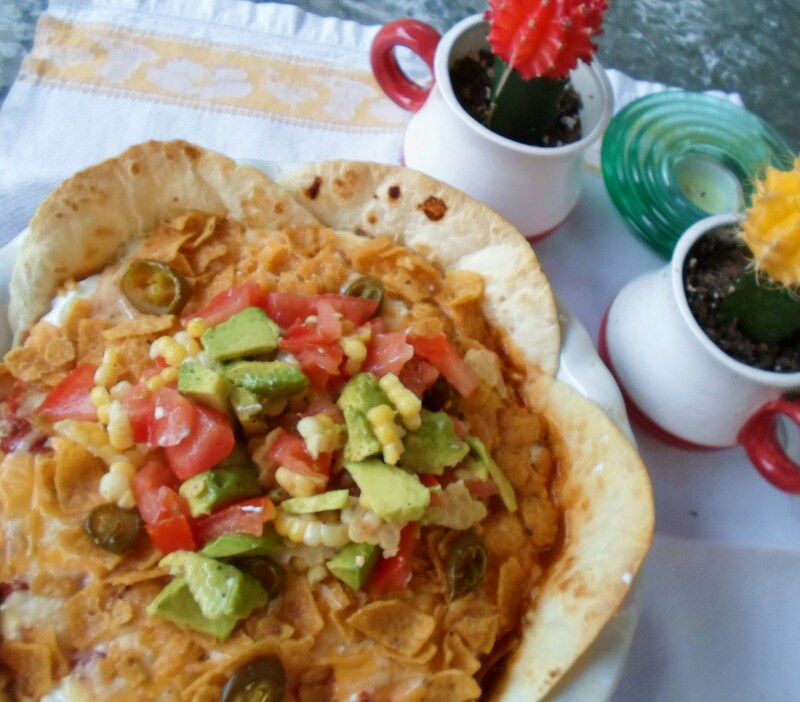 Line a deep dish pie pan with as shown in the photo below, slightly overlapping the “petals” of the tortilla flower. 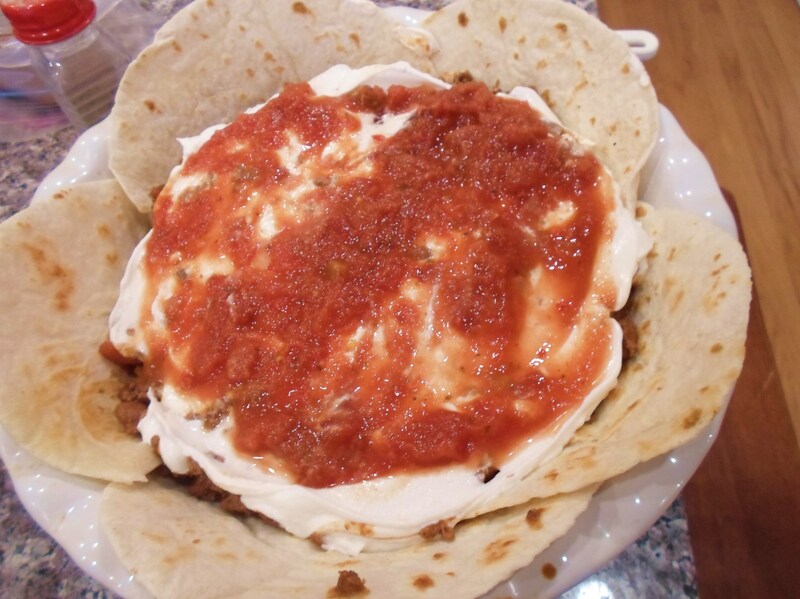 Gently spread the sour cream or Greek Yogurt over the beef mixture. Next spread on the salsa. 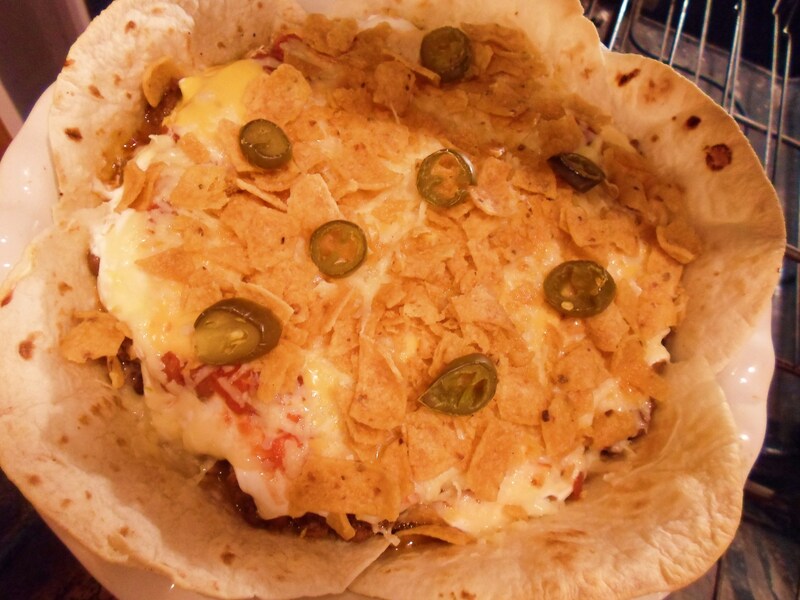 Then sprinkle the grated cheese over all, followed by an even sprinkling of crushed corn chips. Finally decorate with a few jalapeno slices.Bake for 20 minutes. Remove from oven and let sit for 5 minutes while you make a quick fresh salsa topping. In a bowl, combine tomato, avocado and corn. Give this mixture a quick squeeze of fresh lime, a dash of salt and a pinch of sugar. Toss. 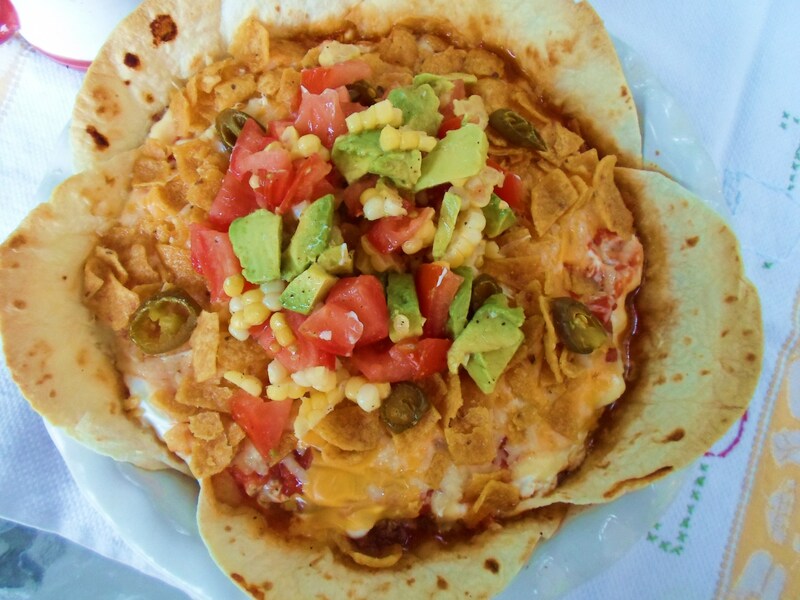 Pile in the middle of the tortilla pie. Use a very sharp serrated knife to cut pie shaped wedges. It may be a little messy if the pie is still hot, so feel free to serve in a bowls if you prefer. 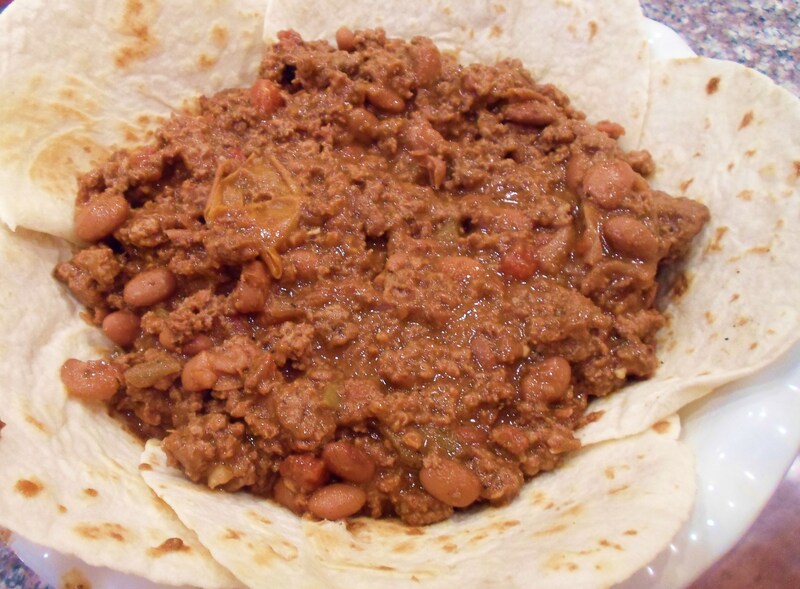 Vegetarian Version: Replace beef with 1 cup lentils or other beans (in addition to the ones in the recipe), 1/2 cup grain such as quinoa or rice, 1/4 cup chopped nuts such as walnuts, and 1 cup chopped mushrooms. Vegan Version: Follow Vegetarian Version above for meat replacement. 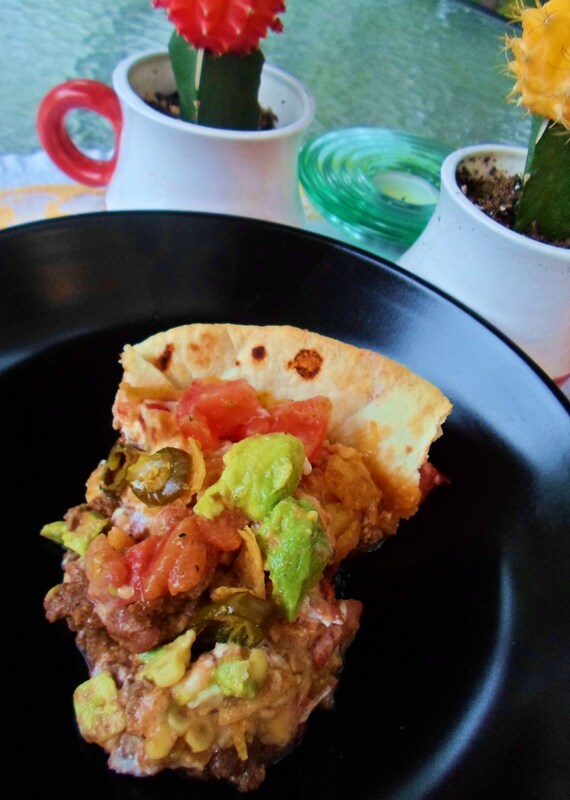 Skip sour cream and cheese layers and cover the pie with fresh guacamole once comes out of the oven and has cooled for 5 minutes. Use just the tomatoes and corn for salsa topping. 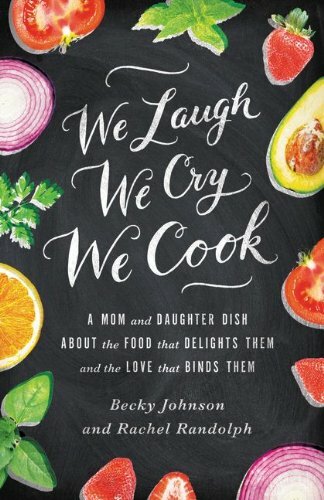 Don't want to miss a recipe? Enter your email address and click subscribe to receive every post right in your inbox. Want Our Recipes via RSS?